Shane Duffy and Ciaran Clark consolidated their Euro claims, but it was a frustrating debut for Alan Judge. WHETHER HE PUBLICLY admits it or not, Martin O’Neill already knows the bulk of his squad for Euro 2016. Tonight’s friendly against Switzerland was never about those players whose places on the plane are already secure, but about those still on the bubble. Alan Judge, Eunan O’Kane and Johnny Hayes all made their senior international debuts but it was a older “new boy,” Shane Duffy, who seized his second international start to make the greatest impression. 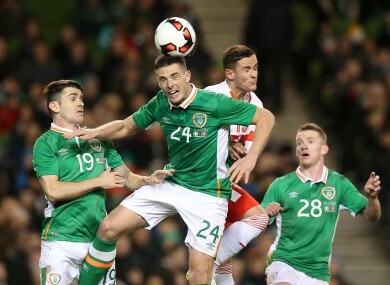 Teaming up with the equally assured Ciaran Clark in the heart of the Irish defence, he marshalled a stout display that held the Swiss to half-chances at best. Not only did he read the game well, he appeared willing to take on a leadership role and was a worthy man of the match. Clark too deserves full credit for leaving his Aston Villa woes far behind him and turning in yet another solid performance in green. Both consolidated their claims for France, and with John O’Shea nearing the end of the international road, tonight may have been our first glimpse at Ireland’s future defensive duo. Along with Duffy, Brentford playmaker Alan Judge has arguably been the outstanding Irish performer at club level this season. There was a clamour for him to get his shot in this friendly double-header, and O’Neill responded by handing him his senior international debut and a full 90 minutes. The manager’s desire to start with both Shane Long and Kevin Doyle in attack saw him discard his preferred 4-5-1 formation for a 4-4-2, and Judge was the most obvious casualty. He is at his best when tucked in behind the main striker but tonight, he was detailed on the wing opposite Aiden McGeady. Ireland couldn’t consistently get him on the ball in areas where he could threaten, and so his opportunities to impress were hampered through no real fault of his own. When Wes Hoolahan was introduced late on and Ireland did eventually revert to their more usual shape, it coincided with some of their better passages of an otherwise uninspiring second half. This was far from a vintage performance by Ireland against a Swiss side who might be ranked 12th in the world but who are realistically no great shakes. Martin O’Neill can rightly be proud of an organised and dogged defensive performance, and another clean sheet, but for large periods Ireland looked limited in possession and lacking in imagination. O’Neill was quick to admit as much in his post-match press conference and said that he would have liked to have seen a bit more cohesion in attack and confidence on the ball. That can be addressed as early as Tuesday night, but when the competitive games of the summer come around, the emphasis will be on points rather than performances. The worry is that unless Ireland can give their opponents enough to mull over in attack, their defence — no matter how robust — will eventually begin to crack under pressure. Email “New faces for the Euros? 3 talking points from Ireland's win against Switzerland”. Feedback on “New faces for the Euros? 3 talking points from Ireland's win against Switzerland”.